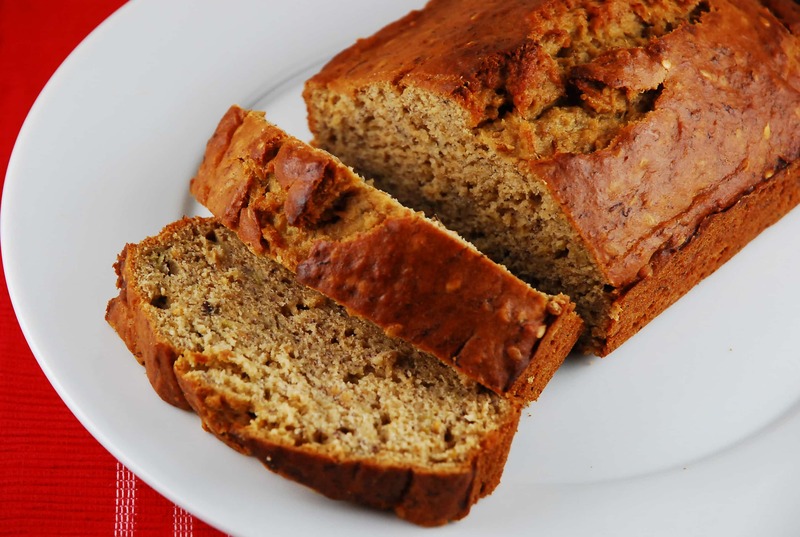 I’ve had my share of Weight Watchers banana bread recipes, but this version is my favorite. The bread comes out so moist and delicious, and the applesauce and vanilla extract help to give it just the right amount of sweetness without having to use a lot of sugar. If you prefer to use a regular, all-purpose flour with this instead of whole wheat, you absolutely can. Or you can use a mixture of the two flours. But I like the added nutrition of the whole wheat. I also added a few tablespoons of organic raw flaxseed because I was serving this to my kids, but that does add an extra Point or two. So, I posted the recipe without the inclusion of the flaxseed. This low fat banana bread is wonderful with your morning coffee or tea, or for an after dinner sweet treat. And at just 4 Points for each thick slice, you’ll be thrilled at how filling and satisfying it is. Enjoy! Moist, sweet, and soft, this fresh baked banana bread is a real treat. Lower in sugar and fat than most other versions, it’s a great treat for Weight Watchers at just 4 Points per serving. Preheat oven to 350 degrees. Spray a loaf pan with nonfat cooking spray. In a large mixing bowl, beat together, sugar, butter, egg substitute, vanilla extract, and applesauce. Using a rubber spatula, fold in the bananas. Slowly mix the dry ingredients into the wet ingredients, about 1/2 a cup at a time. Pour the mixture into the loaf pan, and bake in the oven for about 45-50 minutes, or until a toot picked inserted onto the center of the bread comes out clean. Let bread cool in pan for 5 minutes, then transfer to a wire cooling rack. Cut into 8 equally sized slices. Just made this and it is so yummy!! Love that it’s low cal! Jane is right- the height is only about 1 inch on the ends of the loaf and maybe 1 1/2″ in the middle. Taste is great however. I tried your reciepe and it came out really well. It had the right amount of sweetness. Do you have any banana bread reciepes which use greek yogurt. I saw some online reciepes using greek yogurt instead of apple sauce. can i substitute applesauce with other stuff? I made the recipe exactly as directed and i didn’t rise much. it’s only about and inch thick after falling. tastes great but i’m not sure what i did wrong. You an simply select print, then when your print menu appears, I select to print only page 2. then the other 14 pages don’t print. Hope that works on your computer. How do I subsitute the egg beaters with egg? You’ll use 1/4 cup liquid eggbeaters for each egg. I made this but made it tropical by adding 1 tsp coconut extract and a sprinkling (maybe 2 tb) of unsweetened shredded coconut on top. It was very good. Thank you for all your fabulous recipes !! Tried this and it’s amazing, super easy to make, and insanely addicting. I’m 14 years old, LOVE to cook (especially baking) and almost my entire family is on weight watchers, it’s a terrible mix because, in my dad’s words, I “Bake too well” which basically means that even though I love baking, I can’t unless it’s weight watchers or terrible because my family can’t resist the temptation. Naturally the, I ADORE when I find good weight watchers recipes that don’t require splenda instead of sugar, or portions to small for even a mouse to enjoy! I made three batches of this four days ago and we’re already out, and it was demanded that I make more (which I don’t mind at all of course). Thanks a ton for posting good, easy, and more importantly HEALTHY recipes! I am making this today! I plugged the recipe into Recipe Builder on WW website because I only have all-purpose enriched unbleached flour and Splenda Baking Sugar on hand. With these changes only, one slice (1/8th of loaf) was only 3 WWP+. Can I use just white enriched flour? What is the difference between pastry and enriched? Yes, you can use white flour, but it will lower the fiber and protein count, thus making this dish a Point or two higher. I recommend using whole wheat pastry flour over whole wheat all-purpose enriched because the grind is finer and it makes for a softer end product. I just made banana bread yesterday, I’ll have to try this recipe next time! Looks great! I made these into muffins…I ended up with 9, husband loved them…me too!! As long as the same amount of ingredients is used and you make the same total servings, then yes! I’ve been on a banana bread craze lately. I can’t wait to try this recipe! thank you for a recipe where the portions are “REAL” not a loaf with 16 slices…. Right!?? I go crazy when I see a “light” recipe that is just a regular recipe with a zillion servings. Of course it’s “Light”…I’m only eating a crumb!!! I need REAL portions!